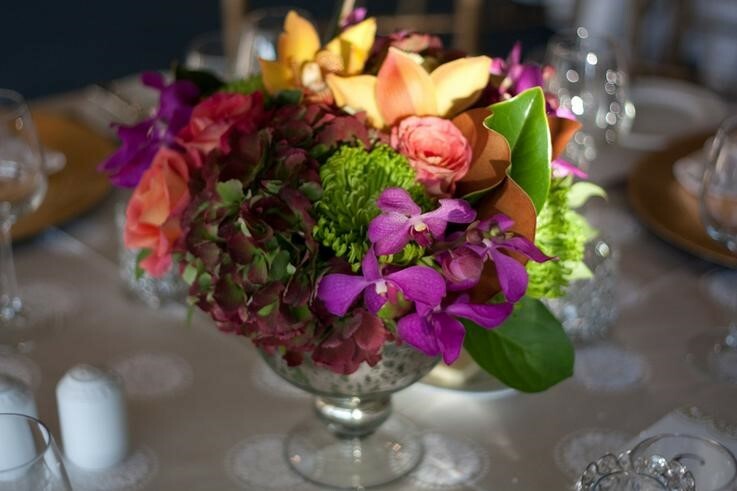 Nothing is more breathtaking or celebratory than a gorgeous flower arrangement. For those of us who love flowers but lack the experience and training of floral designers, there can still be hope. Thinking like a florist may guide our decisions when we arrange flowers, be they from the grocery store, our own garden, or a gift bouquet received from dinner guests. Flowers are a beautiful bundle of joy. Floral arrangements, elaborate or simple celebrate many moments: the bounty of a garden, an engagement, a friendship, a wedding, and yes, even a funeral honoring a life lived. One important consideration is how the arrangement will be used and the optimal time it needs to last. Special events for example, are often of short duration and can use flowers that evoke transient beauty and fragility, but may not last long. 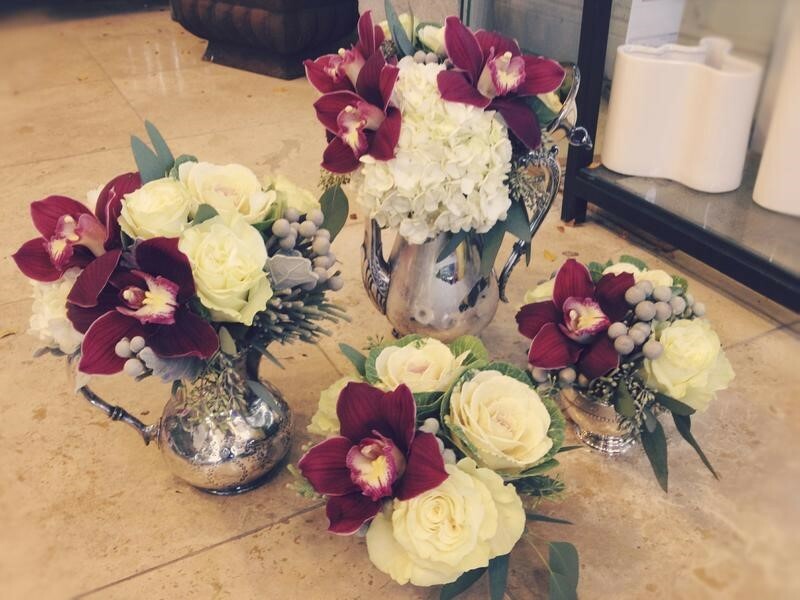 The arrangement pictured below was made with dahlias, clematis, gardenias, and Dusty Miller. Other arrangements, meant to be enjoyed for longer periods of time – days and even weeks – are designed with stems that have staying power. Think of an arrangement sent as an expression of sympathy or gratitude using roses, orchids, mums, and magnolias, pictured below. Hyacinths, tulips, ranunculus, viburnum, and lilies could be other choices; blossoms that wilt can be removed from the arrangement, as needed. English garden – typically composed of annuals, arranged to look natural, as if they are still growing in the garden. 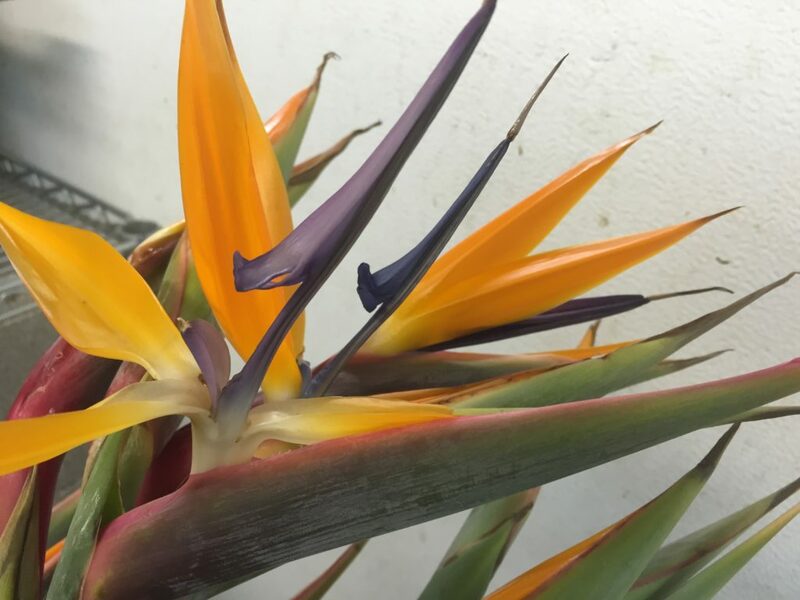 Modern or modern exotic – the use of tropical flowers and foliage like bird of paradise, gingers, monstera, and banana leaf, that distinguishes this style; arranged as both linear or bountiful designs. Whimsical – described as romantic and fun using flowers with pronounced petals like zinnia, gerberas, and dahlias; this style often uses flowers that bloom in late summer. Clean lines – as the name suggests, the linear design is the dominant and dramatic focus, using geometric forms, the vertical axis, a binding point, and often with minimal flower variety. The relationship between component parts – the flowers, vase, and design style – takes talent or practice. 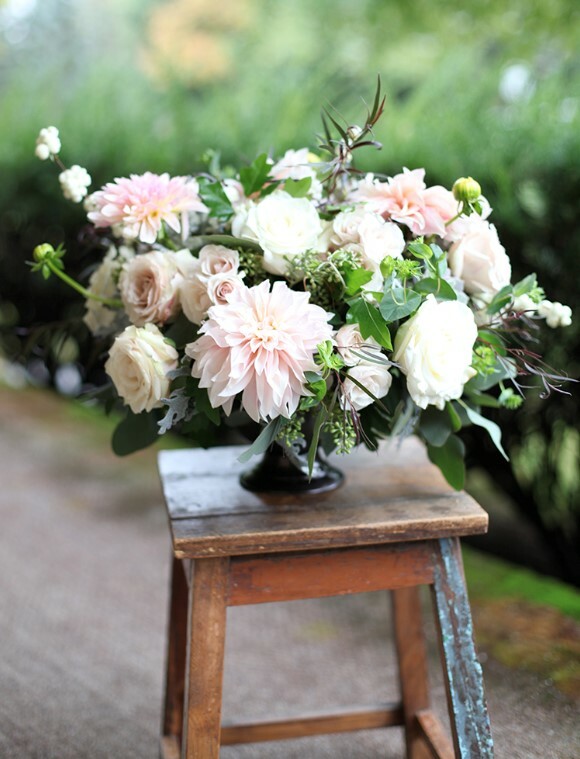 Observing arrangements at functions, flower shops, or online can provide ideas for DIY florals. Take notice of how the pieces complement on another. The Victorian trend, popular with today’s brides, uses antique containers like mint julep cups, china bowls, Limoges vases, and flowers that complement the colors, shape and size of the container. Classic glass cubes, mason jars, and ceramic containers, which offer flexibility for use with a wide array of flowers and foliage, are popular for arrangements for the home as well as weddings any time of year. Having the right tools goes a long way in successfully arranging flowers. Have garden cutters, paring knife, water on hand to immediately immerse cut flowers, and containers are the essentials tools. (Scissors can crush some stems preventing them from absorbing water.) Floral foam, either the best or worse tool depending on your perspective, can hold stems securely in place during design and transportation but are laden with chemicals some choose to avoid. Floral tape and chicken wire used as a grid on the container mouth can be effective alternatives. Stems should be conditioned; each stem cut individually and immediately placed in water. Shave bark off branchy stems such as lilac, hydrangeas and viburnum, and make an upward cut in the middle of the stem. 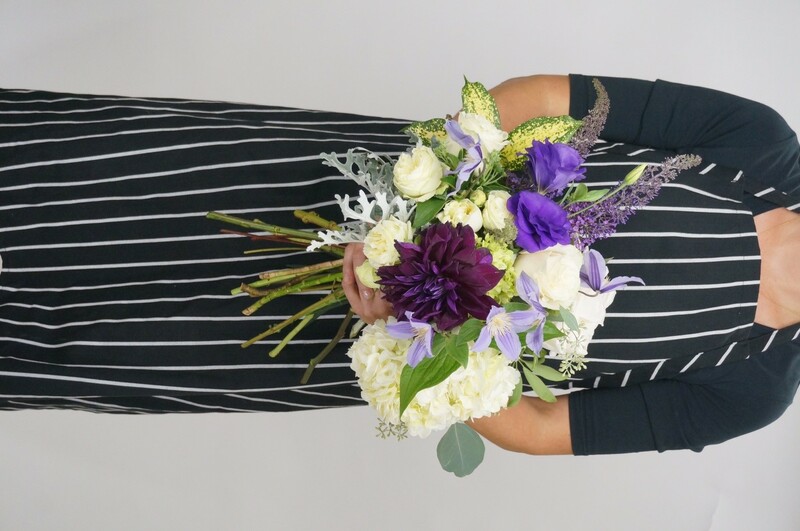 The most foolproof floral arrangement is the hand-held monochromatic or tone on tone [color] bouquet (same or different flower but in the same color wave). Hold the stems in your hand shaping them into a uniform height. Cut to all the same length, placing the stems into fresh water, perfectly fitting the stems into the diameter of the container’s mouth so that the hand-held shape is maintained. For those intending on using flowers from their garden, think ahead. It is critical to plant the types and colors of flowers and greenery (often cut from shrubs) that compliment the preferred style. All of this is personal preference. And experience. Testing, trying, and enjoying different arrangements will lead to what suits your home, occasion, and sensibility. Gone are the days of only three shapes for floral arrangements—line, line-mass, and mass. Tall, full, minimalist, luxurious, and linear styles – all are acceptable. 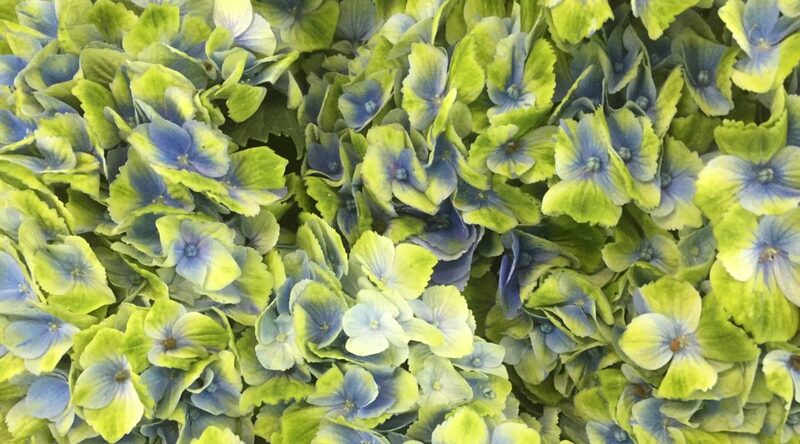 Unconventional pairings like pastels with saturated colors, larger blooms such as dinnerplate dahlias, hydrangeas, and peonies, juxtaposed with smaller blooms of craspedia, scabiosa, tulips, and ranunculus reflect current trends. So, please yourself. Use the blossoms or foliage that speaks to you, perhaps growing in your own garden (lilac or cherry branches, for example). Consider foliage a secret weapon. Flush out arrangements with foliage of all shapes and colors. Remove leaves below waterline, which will not last very long due to bacteria. Replace with foliage that has been prepped. 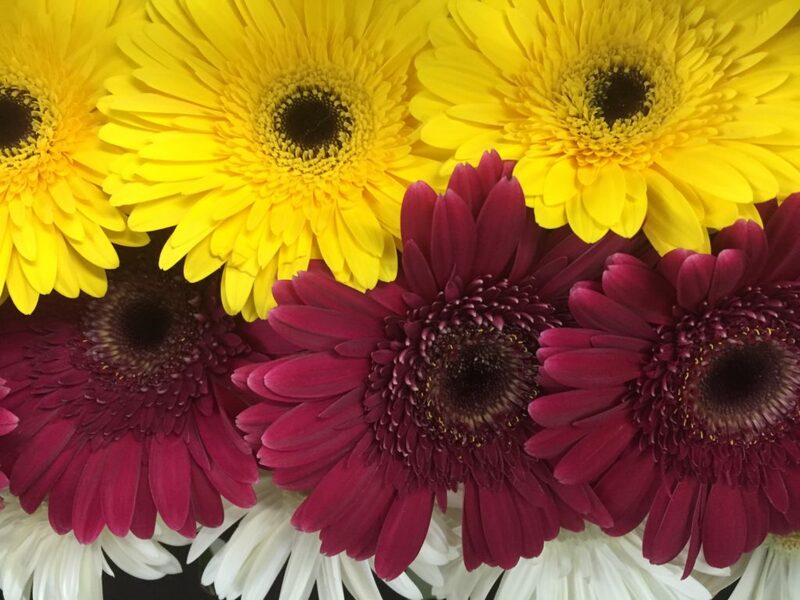 Express yourself with flowers…florists can be your back-up. Hillier, M. Ed. (1990). Flower Arranging. New York: Reader’s Digest Association. Packer, J. (1998). 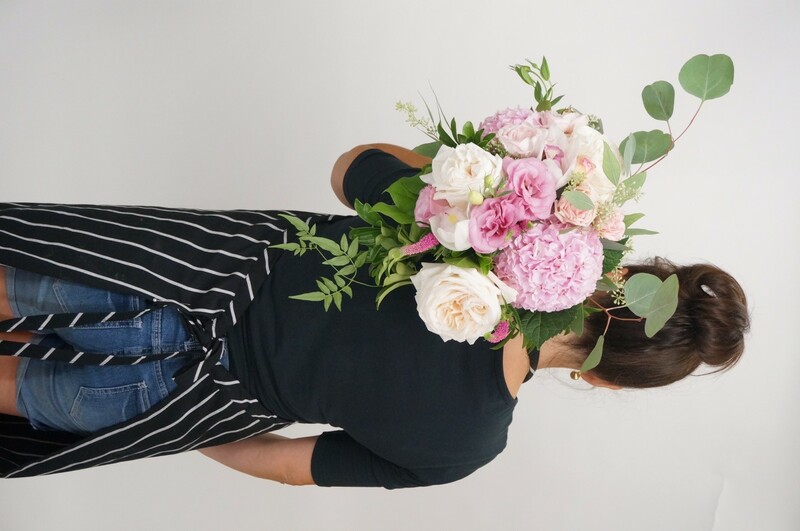 The Complete Guide to Flower Arranging. New York: DK Publishing. Authors Lesley Fleming and Sarah Bayat combine their talents for this series. Lesley is a registered horticultural therapist who uses flowers for therapeutic activities. 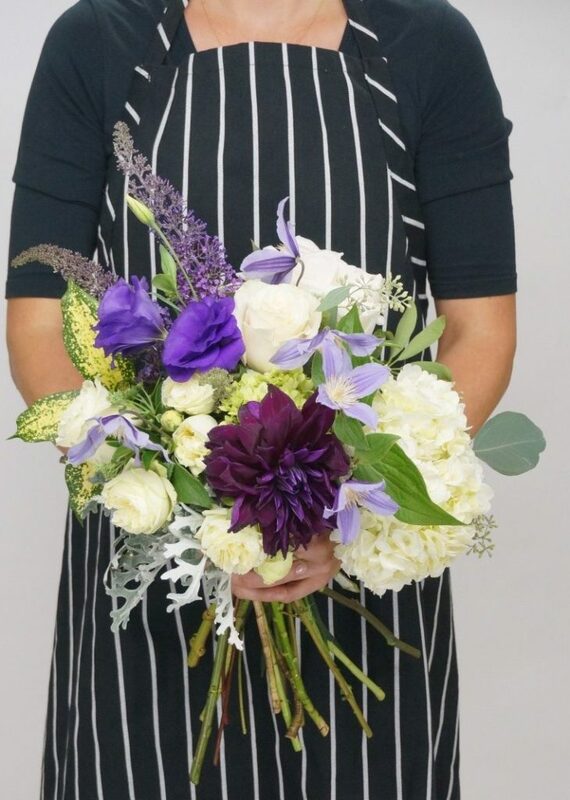 Sarah is creative director of Floris Flowers Co. 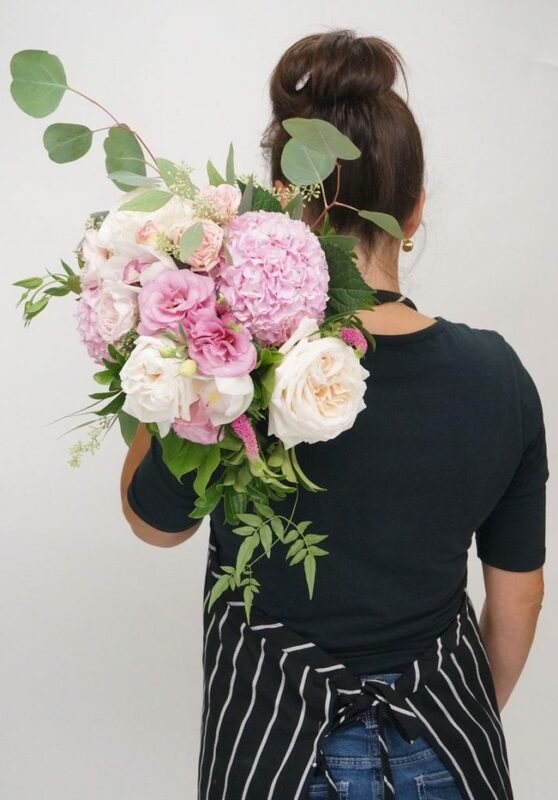 This is the fourth and final article in a series on tips from florists.